I was awake half the night. I couldn’t sleep. Yes, the heat was oppressive but that wasn’t it. My mind just wouldn’t let go of what’s happening in Gaza. I don’t have any answers. I don’t know enough about what’s happening to contribute in any meaningful way to the debate. 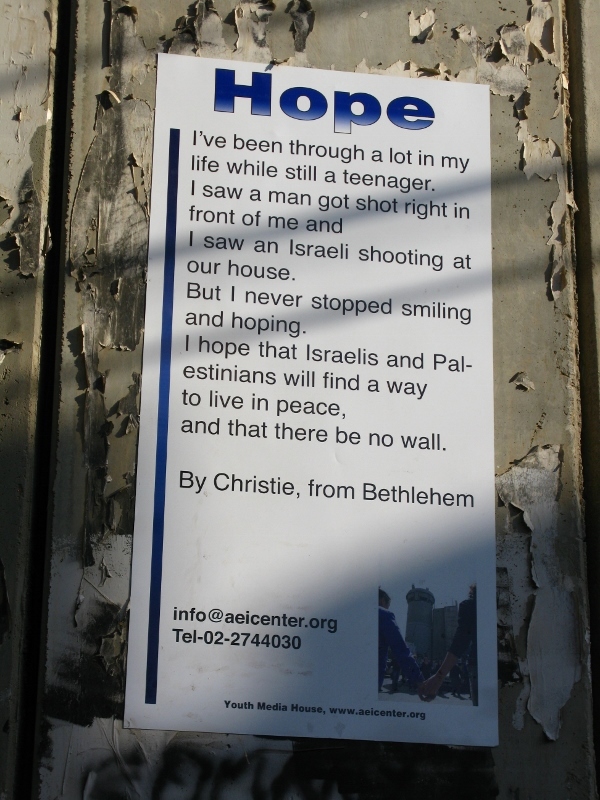 I have never lived in Israel or in Palestine. Other than spending a week there last year, I know little of what life might be like there. I have no close Palestinian or Israeli friends. I’ve never studied Middle Eastern politics. My knowledge of international affairs is limited at best. And yet, it seems as if I’m expected to have an opinion. Everyone else does. I’ve spent the past few days reading posts on Facebook. I’ve been following links. I’ve been reading newspapers. I’ve been combing through blogs. And one thing that puzzles me is how anyone, anyone not directly caught up in it all or an expert on the subject, can categorically say that they support one side or the other, without question. I have questions. Lots of them. 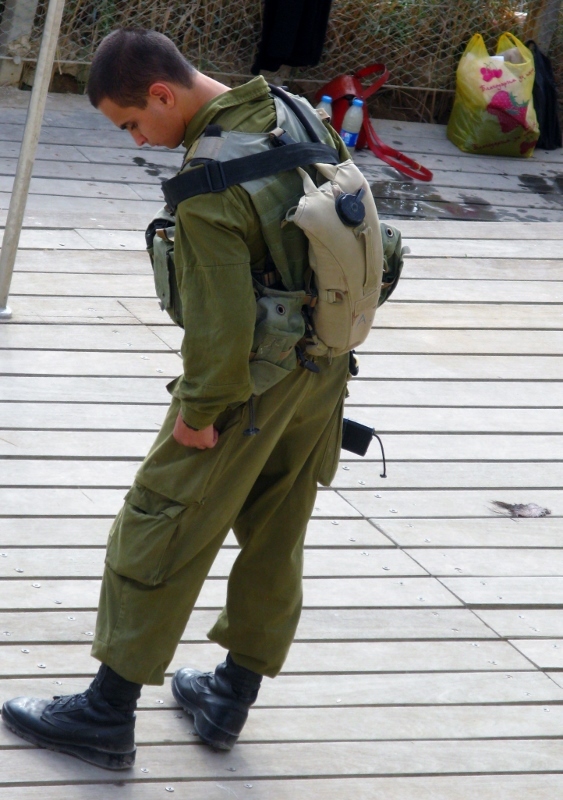 How come the stats I see show more Palestinian civilian casualties than Israelis? Could it be that Israelis better protect their civilians while Hamas urges Palestinians to stay put? And storing rockets in schools can’t be safe, can it? I don’t know. By all accounts, Israel is on the receiving end of more attacks than it makes. And apparently it has offered no military response to many rocket and mortar attacks in recent months. So why then is it the bad guy in this mess? I don’t know. Yes the photos of dead kids and dead women are horrendous. The thought of killing kids, any kid, is beyond comprehension. The civilian death toll is abhorrent. 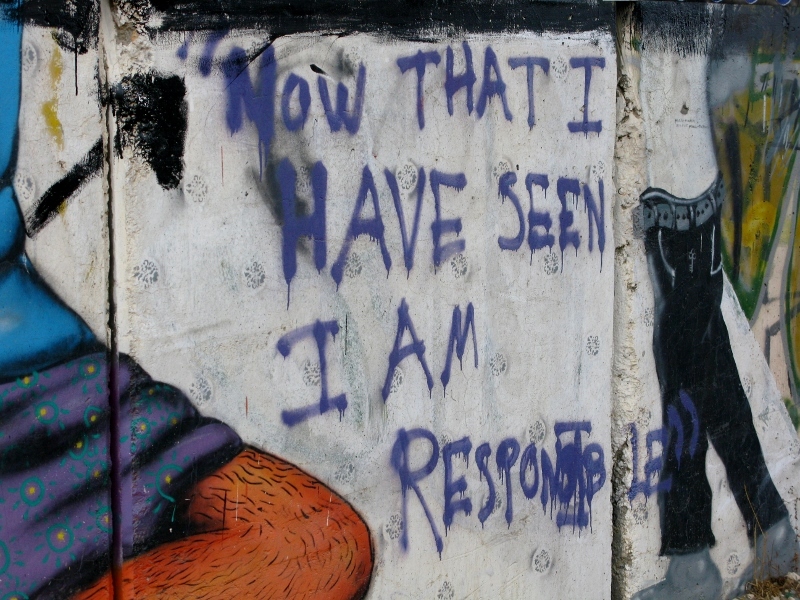 Civilian casualties in any war are tragic – but they are a fact of war. I’m not condoning, I’m not excusing. I’m just saying. For as long as man has been alive, we’ve been killing each other and nothing makes that right. In today’s technology-driven world, soundbites and photos are practically instantaneous. We see death and rockets and mortars and hear cries and pleas and our hearts bleed for what is happening – and we react. We’re human. But are we are seeing an emotional, knee-jerk and all too human response to a situation that could well be being manipulated (however intentionally or unintentionally) by the world’s media and its sources? I don’t know. I do know that paper will take any print. I lack faith in the media to report accurately, with full context, exactly what is happening. Which is why I read, and read, and read – and am still none the wiser. For every answer, I find two more questions. Does anyone really know? I don’t know much. I don’t profess to be any kind of expert. Yet I can’t forget what happened in Bosnia, when the Serbs were castigated by the world’s press, and often rightly so, but equally often as a result of the machinations of the Bosnian PR machine. Even today, Serbia still struggles to shake a reputation that, to my little mind, should equally have been shared with Bosnia. The Serbs I know (and I know quite a few from all walks of life) are, without exception, some of the nicest, kindest, most hospitable, most intelligent people I know and still they’re cast as the bad guys. I am not comparing like with like here, or equating then and now. That would be ridiculous. I just want to voice an underlying concern I have about the possibility of moral manipulation. Israel isn’t without fault. It takes at least two sides to wage a war. 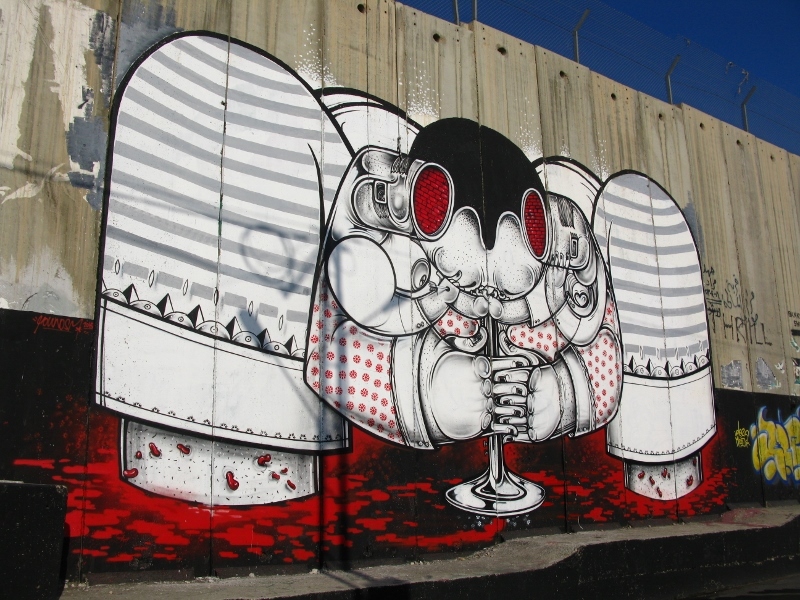 What must it be like for Palestinians to live behind a wall, in a veritable prison? Or to have had to give up their land to create a nation state for Jews? I don’t know. 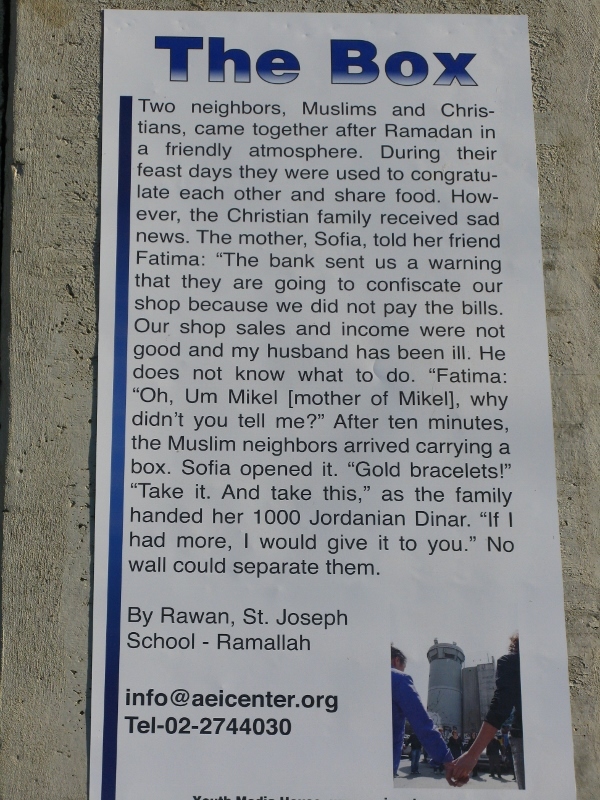 Yes, I read the testimonies on the Wall and I was moved, very moved. And shocked, and horrified. And yet I wonder what must it be like for Israelis living in a country where their immediate neighbours would prefer if they were wiped off the face of the Earth and their collective might could well accomplish this? I don’t know that, either. 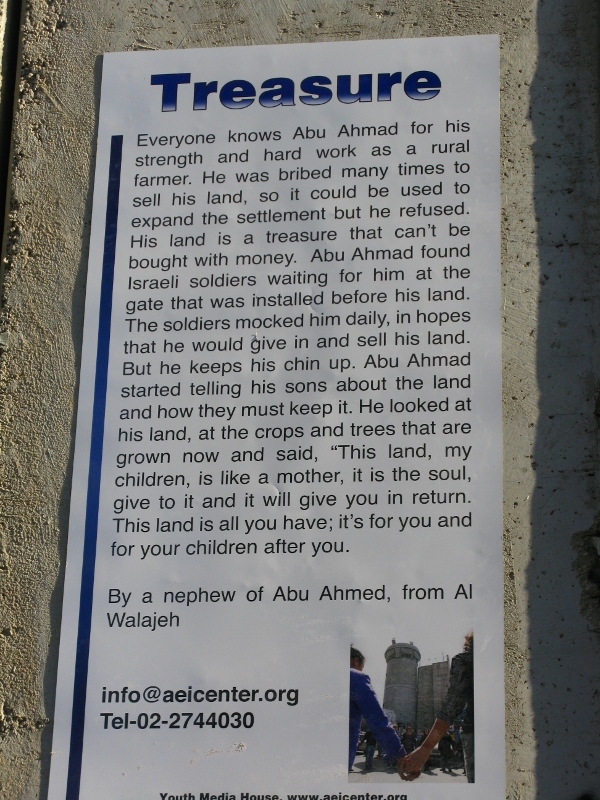 Some say that international laws are being broken, that Israel is in violation by allowing its citizens to live in occupied lands, that it is edging inch by inch into forbidden territory.Others say that Israel has no rights to the land at all. But decisions were made, rightly or wrongly. Some Hungarians might prefer the Triannon Treaty to be reversed just as some Irish might prefer to see a united Ireland. Are they right? Are they wrong? I don’t know. Extremists seem to be ruling the day – people who have little or no interest in finding a compromise in a war that is, to my uneducated and unedified mind, about who gets to keep what land. This latest round in a war that has been going on for decades started when Hamas reportedly killed three Israeli students in June. Israeli extremists reportedly responded. There is no denying the numbers…Palestinians are faring very badly, urged are they are to ignore Israel’s warnings of pending attack and stay home. And should they have to move? Are they right to stay? I don’t know – I’m not there. Surely though we need to look behind the numbers. Behind the images? I see petitions to expel Israeli ambassadors. But isn’t diplomacy the only way out of this mess? 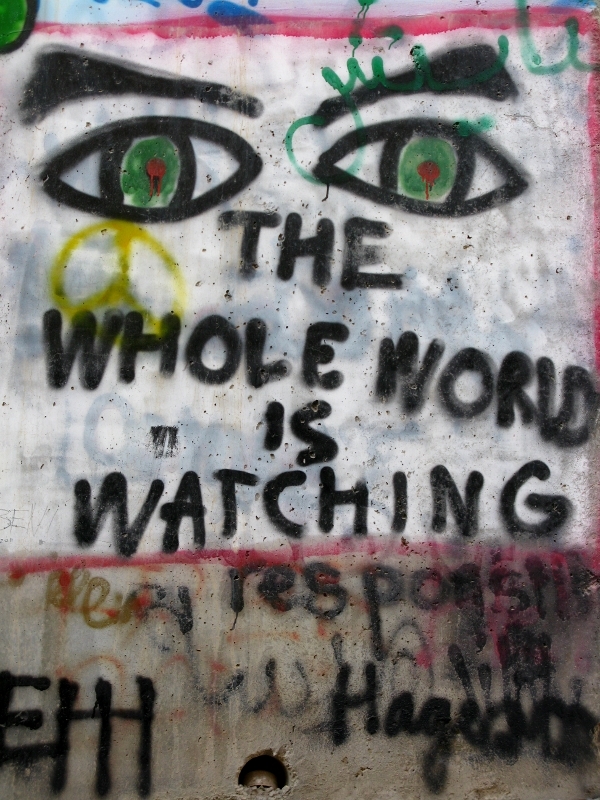 I see petitions to place sanctions on Israel but who will this really affect? I feel a rising wall of revulsion against Israel and I worry that this won’t stop at hating a country but will degenerate into hating individuals. 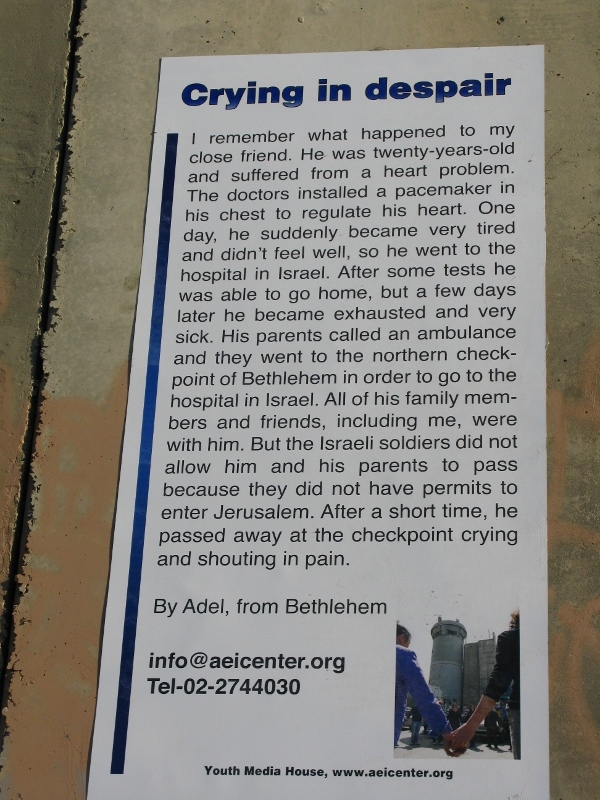 What must it be like, as an Israeli, to be living anywhere in the world right now? I don’t know. What must it be like as a Palestinian to have your leaders tell you to be brave in the face of death? I don’t know that either. There is so much that I don’t know. I will continue to ask questions. You might continue to answer them. But then I will ask how you know what you know and why you think as you do. It’s a given that it’s inexcusably wrong to kill kids – but even to this uneducated, unedified mind, there has to be more to it than that. It’s not that simple. If I don’t agree with your opinion, or I don’t take as gospel what you are saying, or I don’t apologise for asking questions that you believe make me partial to Israel, am I wrong? I can’t pretend to know what I don’t. I can’t see how I could ever take a side without speaking to those involved, without living the lives they live, without growing up in a culture that is so alien to the one I know. If you are happy to do so, if you know enough to make your mind up and debate your corner, hats off to you. But please, don’t feel the need to convince me of the same. By all means engage me in conversation. Let’s have a discussion. Feel free to share what you believe. But please, don’t evangelize. Be open to what opinions I might have that may not tally with your own. Be open to questions I might ask, even if you don’t have the answers. And please, which ever side you are on, don’t make this about individuals. Nations act in the name of their citizens, but not each and every one of those citizens necessarily agrees. 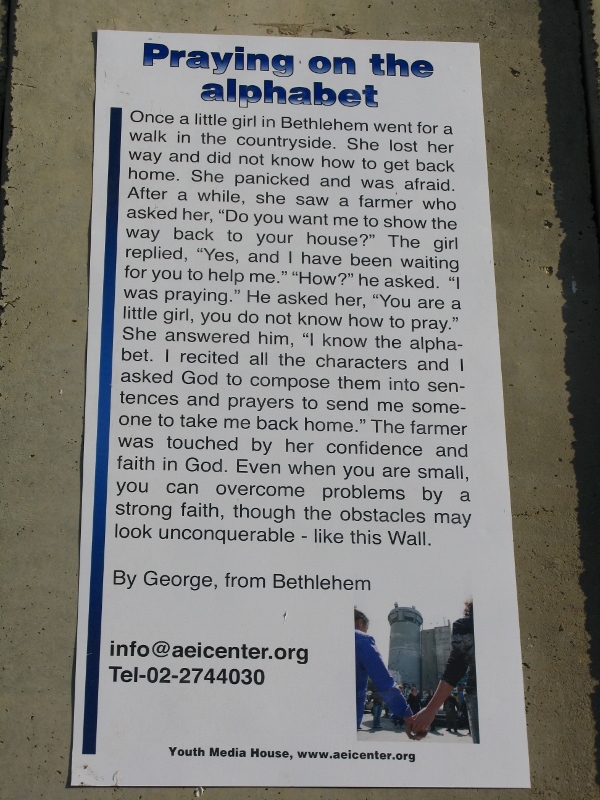 It may seem like I’m a little obsessed with the wall around Bethlehem and perhaps I am. 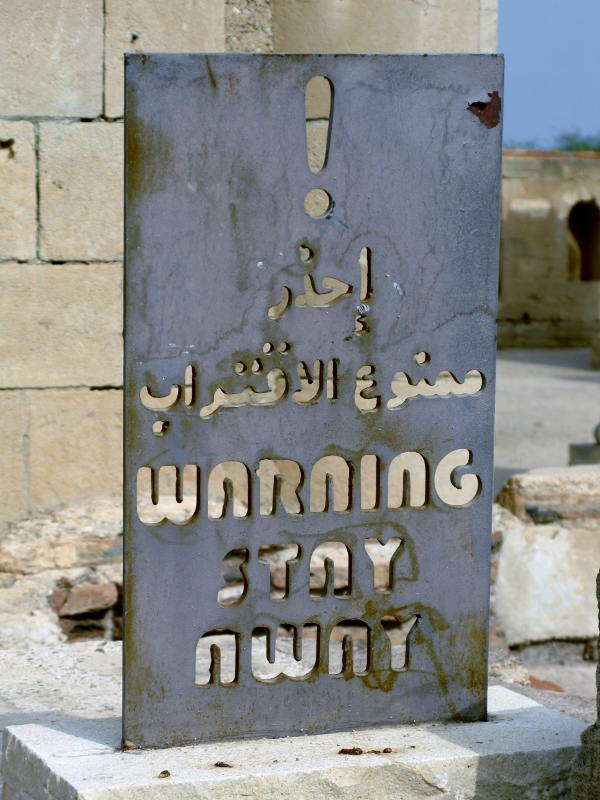 Oddly enough, it was the non-religious aspects of the Holy Land that intrigued me most. 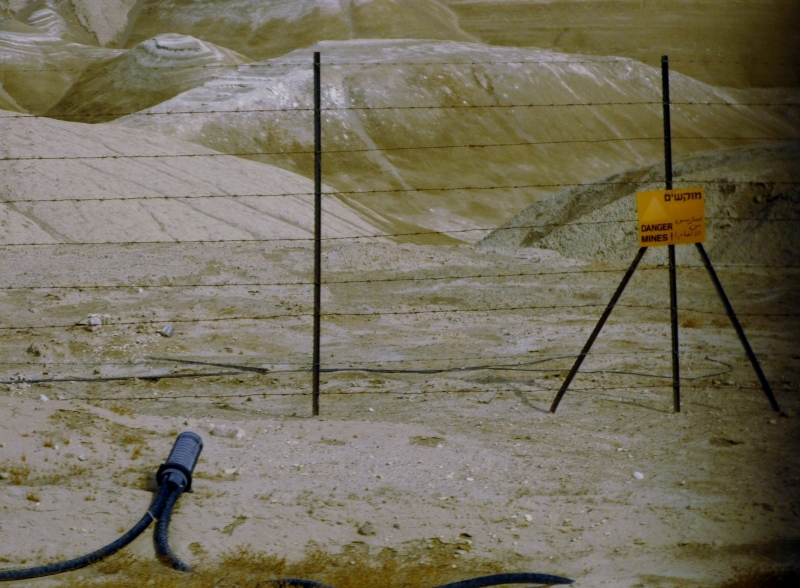 The Golan Heights, the Dead Sea, the Wall. What that says about the state of my religion is anyone’s guess. 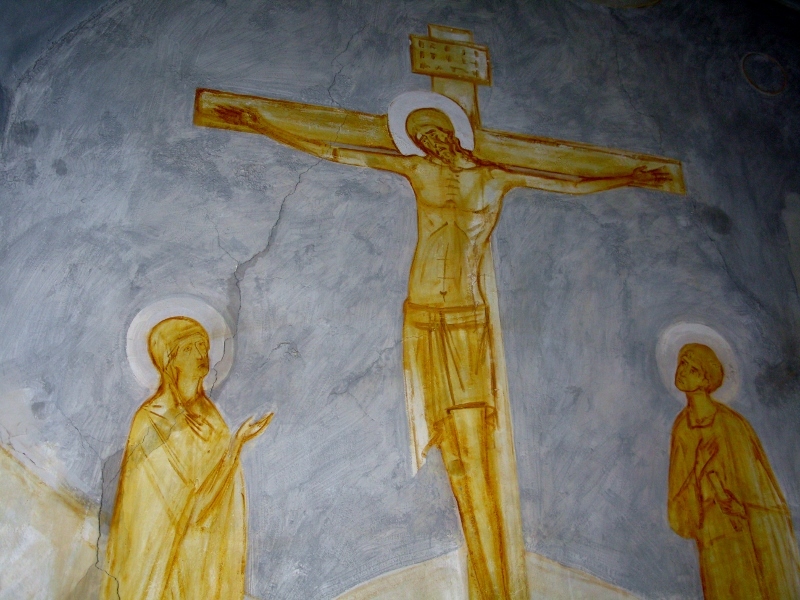 I’ve been trying to figure out why a church-going Catholic might have had difficulties in the holiest of holy lands and have come to the conclusion that the pundits were right. I must be of the pick’n’mix variety. But I digress. 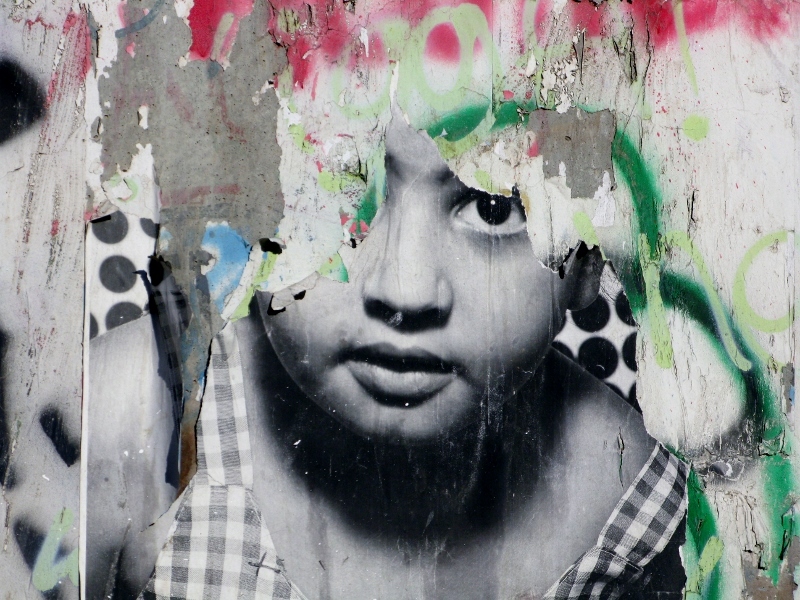 In addition the graffiti, there are posters depicting snapshots of the lives of those who live there. They tell their own story. I’ve posted a few here, those that resonated most, and can’t help but believe that any one of them would touch the hardest of hearts. 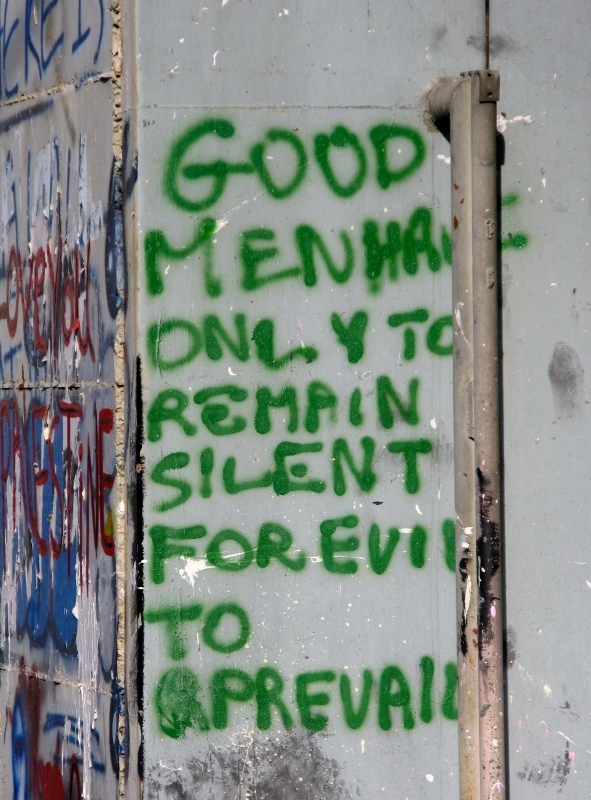 I’m a fan of graffiti… not the aimless posts of I wuz ‘ere or the the like … but the clever kind, the witticisms, the art. 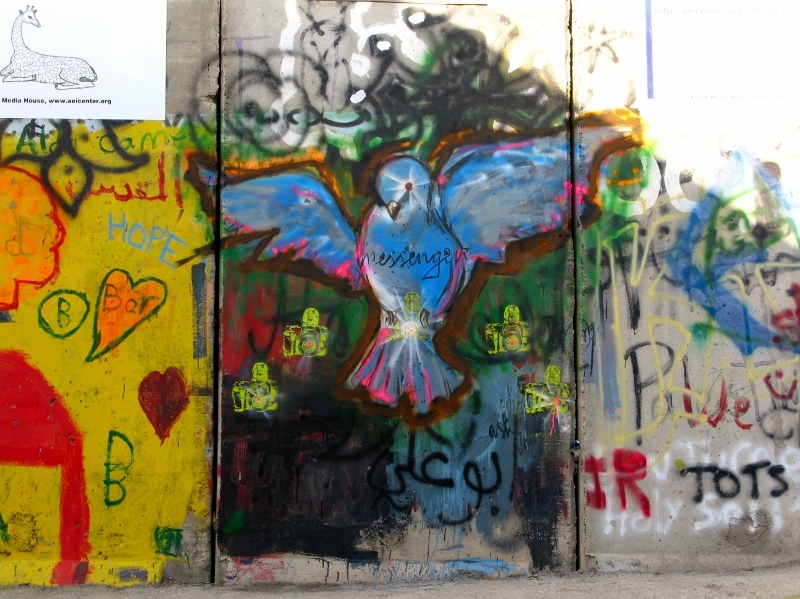 So on that night a few weeks ago, when I crossed from Jerusalem to Bethlehem, I was so absorbed in reading the graffiti on the wall that I didn’t really notice the wall itself. Having only just landed, I wasn’t nearly brave enough to do something stupid like take out my camera, but emboldened by some degree of familiarity that came with five days of residence in Bethlehem, I got up early one morning and, accompanied by the very able (and somewhat imposing) MM, headed back to said wall to take some photos. 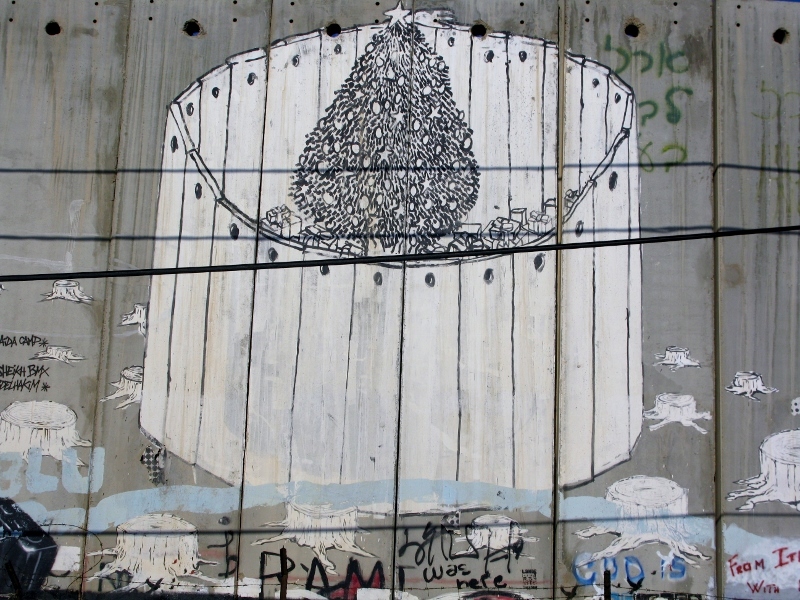 Bethlehem is contained within parts of what is known as the Israeli West Bank barrier – a division, that when finished, will run about 700 km in total. 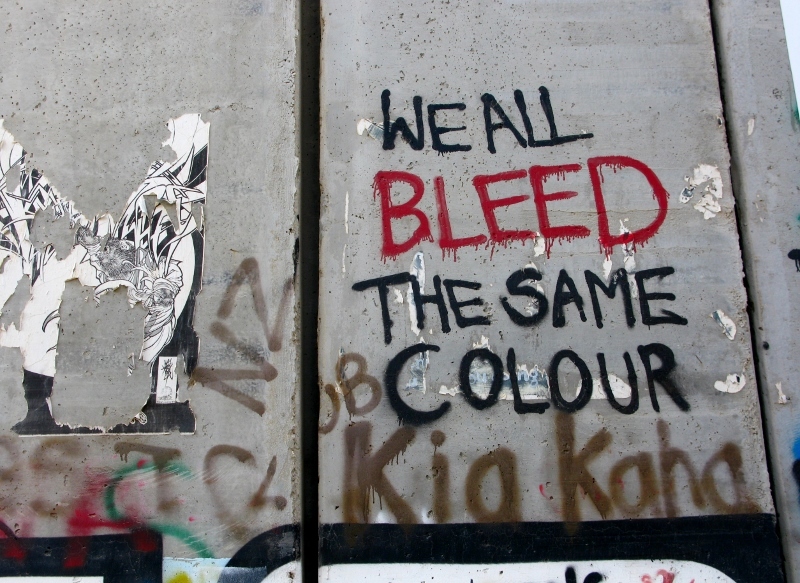 The jury is out on what it’s actual name is: Israelis describe it as a separation, anti-terrorist, or security fence while the Palestinians call it a racial segregation or apartheid wall. The BBC prefers to call it a barrier. 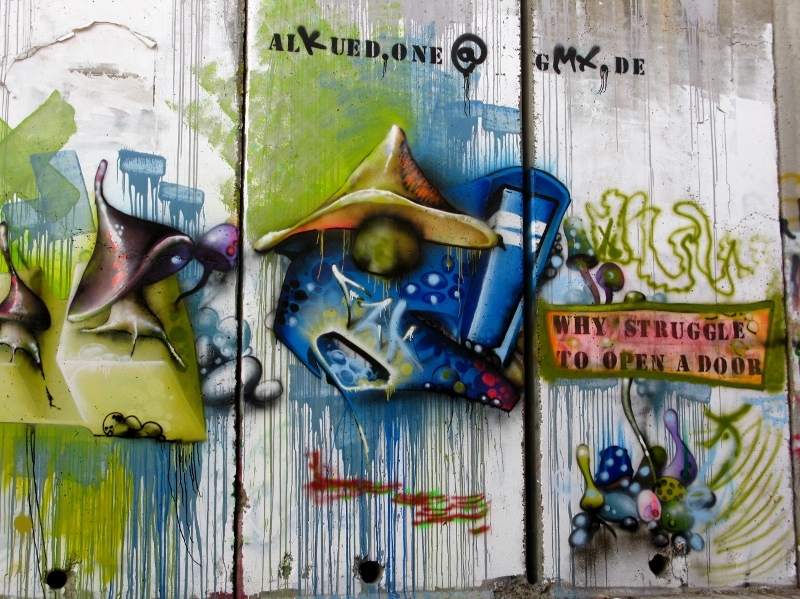 Right now, the 8-metre (26 ft) wall that runs alongside Bethlehem for about 15 km is an open page for graffiti artists the world over. 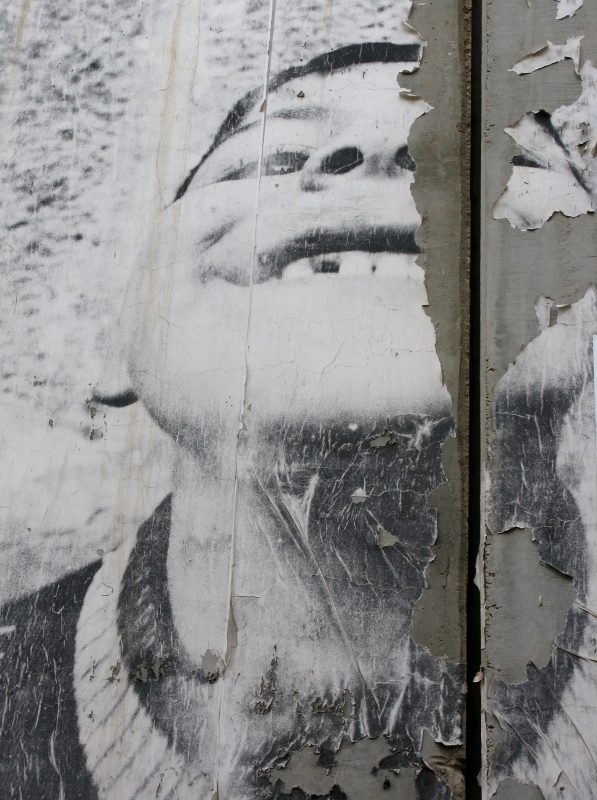 Probably the most famous of them all, Banksy, visited in 2005 and left his mark on the city. Unfortunately, so early in the morning, the Banksy shop hadn’t yet opened for business (good to see, though, that some enterprising soul is making a living from the art). 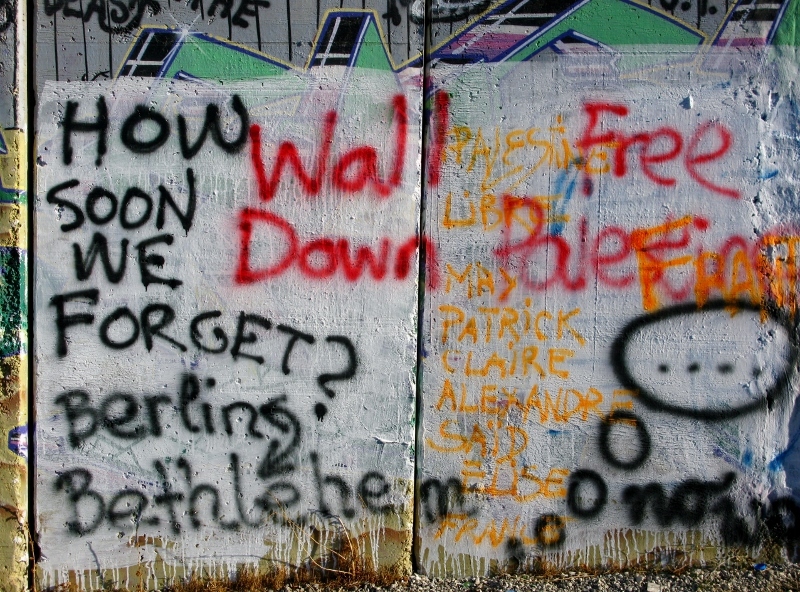 , what stuck me most forcibly was that I hadn’t even known this wall existed. 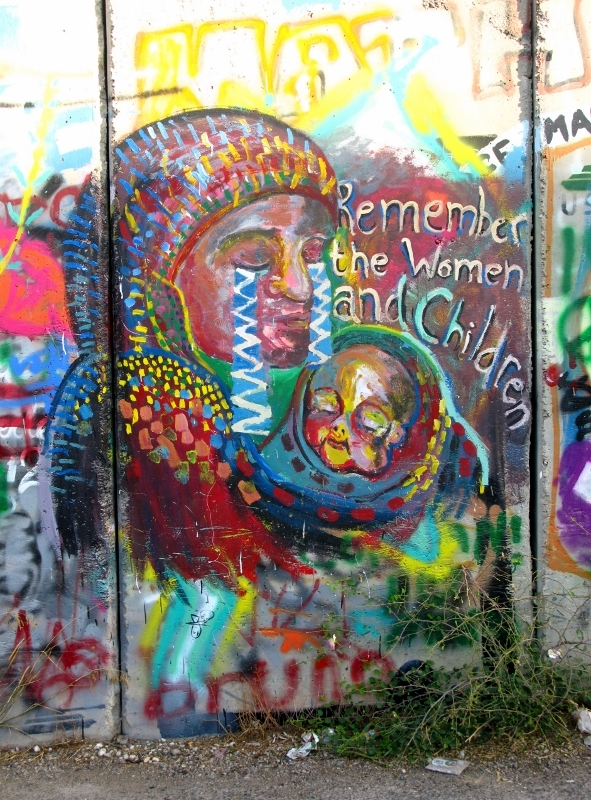 Unlike the Berlin Wall, it doesn’t seem to attract the same degree of infamy. Once again, I was reminded at how sheltered I’ve been and how little I really know about what is going on in the world. It’s as if I live in a bubble far removed from anything bad or evil. And while I might read about what is happening elsewhere, I can’t really even begin to understand what it must be like for people living with this every day. 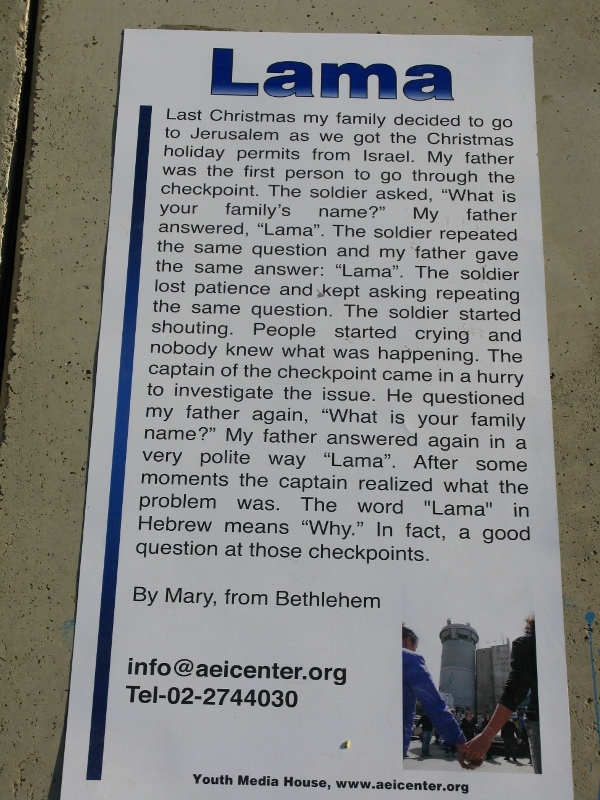 For me, crossing over from Jerusalem to Bethlehem and having to walk through the checkpoint was a little exhilarating the first time; an inconvenience the second. To accept this as part of everyday life would, I’m sure, not take very long, but what is lost in that acceptance? I stopped dead at one point and felt a surge of helplessness. What could I possibly do that would in any small way make a difference? There is so much bad going on in the world, so much injustice, that were I to sit and think about it all, I’d surely go slowly mad. Tomorrow, I’ll share some wall stories with you – but today, as I look back on the last few weeks of travel and the different places I’ve been, I’m truly grateful that the novelty of packing a suitcase and going hasn’t yet worn off. It might be fading just a fraction, but the chance to see new places, experience new things, and create new memories is one for which I’m eternally grateful. 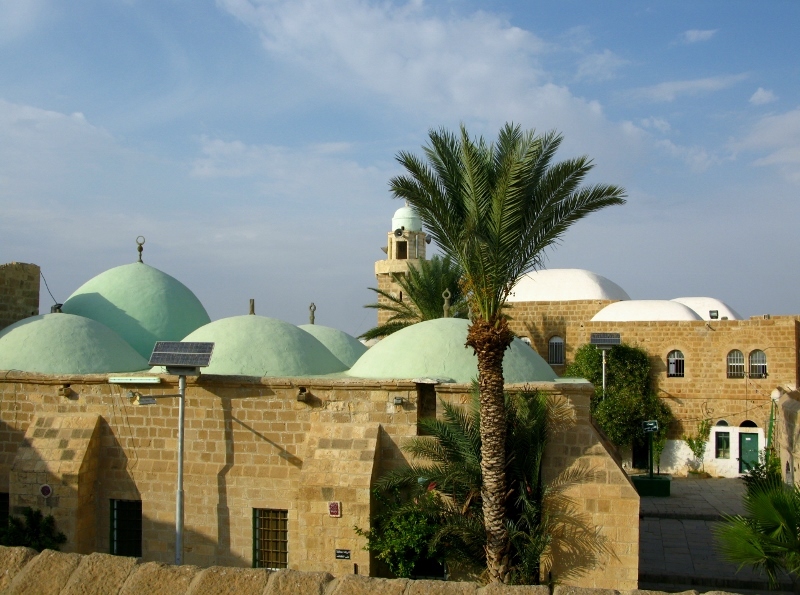 Nabi Mosa mosque is said to be a sacred place for Muslims because it is here that the prophet Moses is supposedly buried – mind you, that, like much else in the region, is subject to debate. 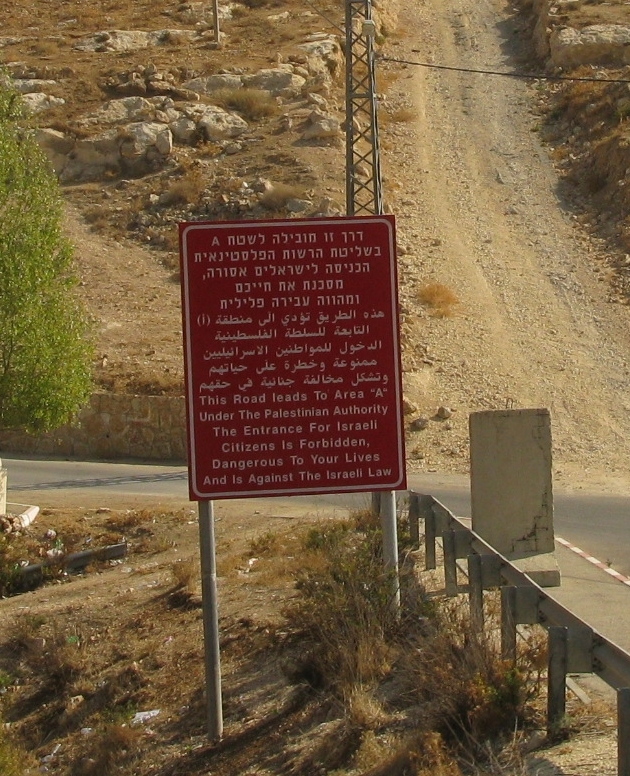 The road from Jerusalem to Jericho was well travelled by Mediterranean Arabs on their way to Mecca. Nabi Mosa is situation at what would have been the end of the first day’s walk. 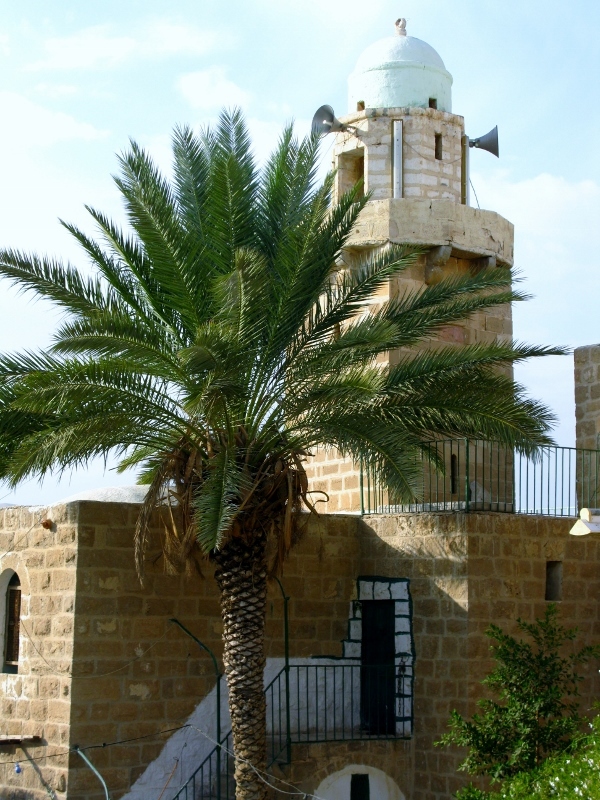 Nearby Mount Nebo is where Moses was thought to be buried back then – his ‘move’ to to Mosque is thought to be a matter of invention. The current building was completed in the late 1400s and restored by the Ottoman Turks in 1820. It’s now home to a treatment centre for addicts. To give the local Muslims something to celebrate while their Christian counterparts were celebrating Easter, the Ottomans instituted a seven-day religious festival called Nabi Mosa. Thousands of Muslims would gather in Jerusalem and make the trip to the mosque where they’d celebrate for days before returning home. 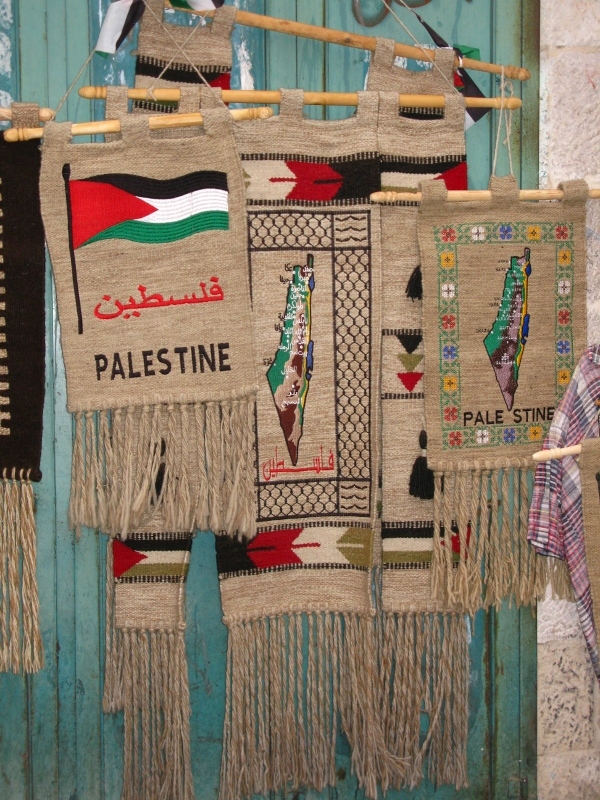 When Jordan took over the administration of the West Bank after the 1948 Arab-Israeli war, the festival was more or less cancelled. In the shadows outside the mosque lies an old cemetery. The ground is rock solid and I can’t begin to imagine how anyone would dig a grave. 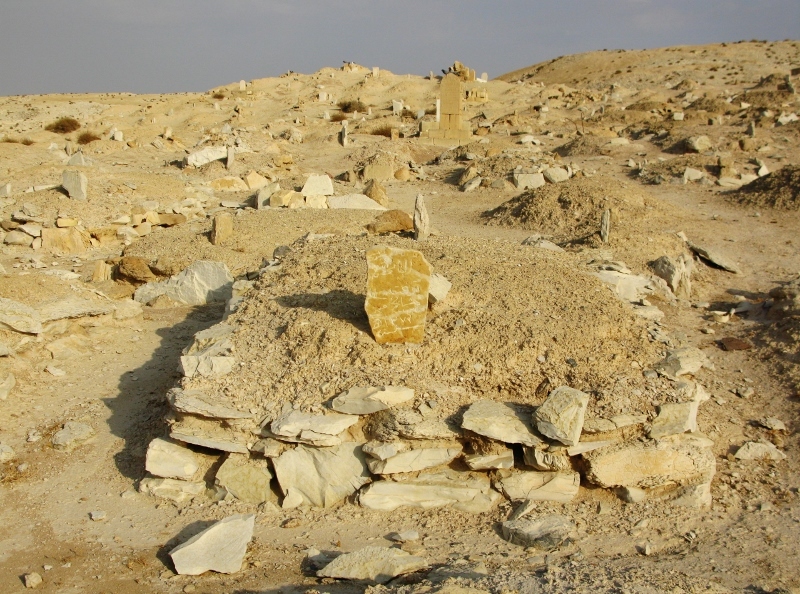 This probably accounts for the raised grave sites. The inscriptions meant nothing to me and I can’t find any account of it anywhere so it’s difficult to tell how old it is. 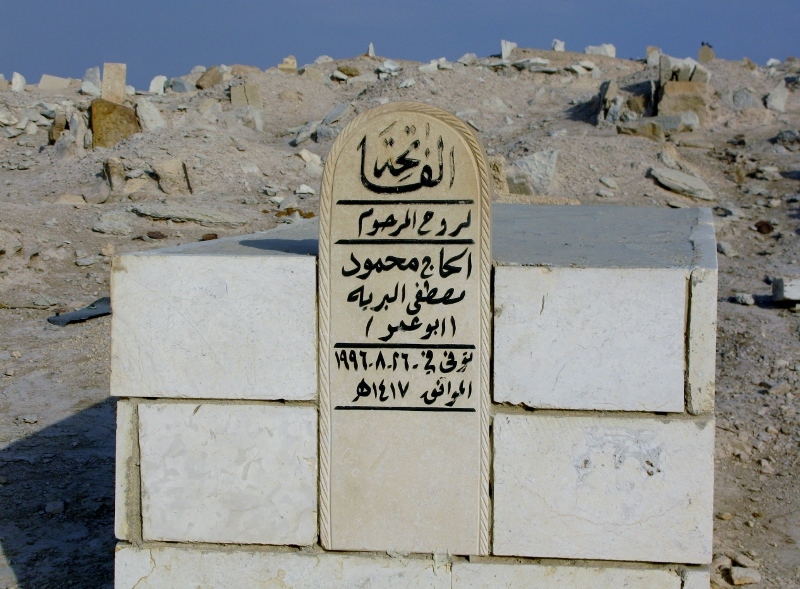 Graves seemed to be scattered around rather than laid out in any particular order reflecting the chaos that seems to be so innate to life in Palestine. and in the heat of the sun, miles from anywhere, the place had a serene and saintly feel to it. We were the only ones at the monastery and I was the only one in the cemetery. For the first time in days, I felt like I was communing with something other than commercialism. And I actually took the time to pray. 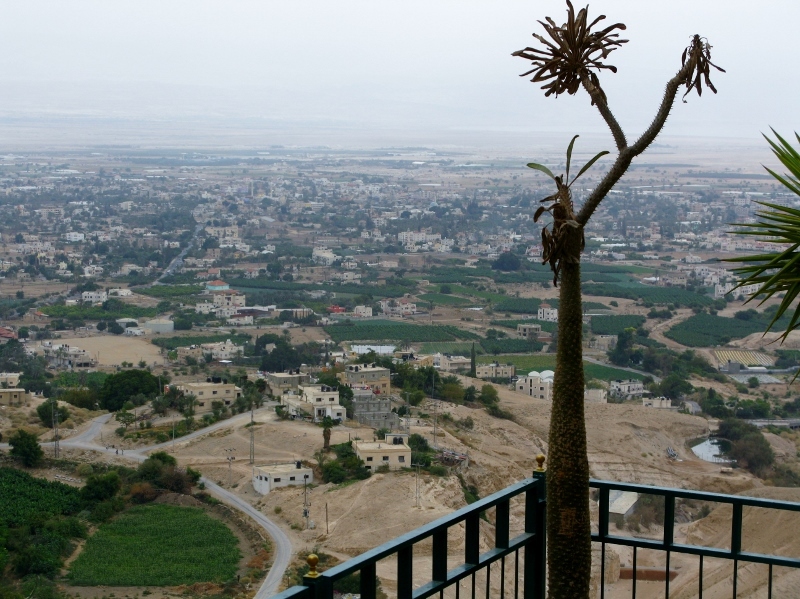 Billed as the oldest city in the world, Jericho was one of the few places that saw little action during the two intifadas (Palestinian uprisings, 1987-1993 and 2000-2005) As a result, the Israeli presence is notable by its absence. 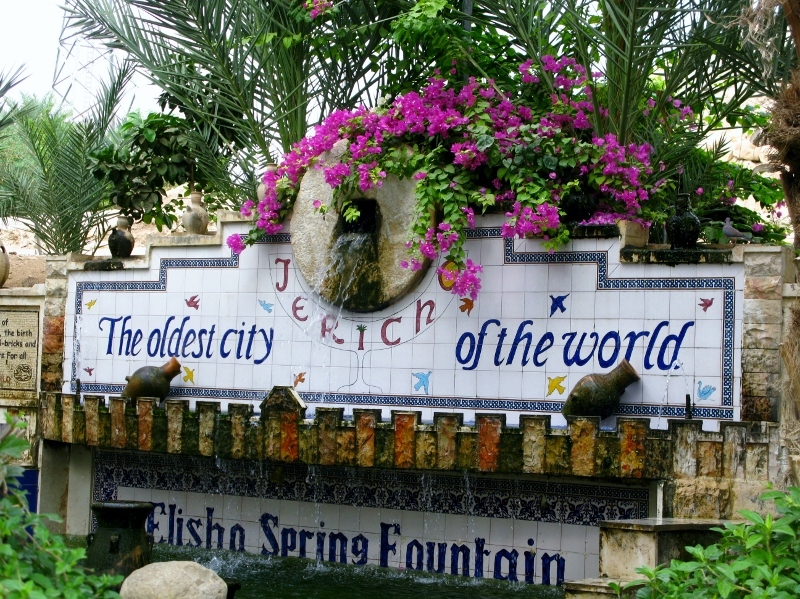 Translated by the Canaanites as the Moon, in Syriac the name Jericho meant scent and odour. 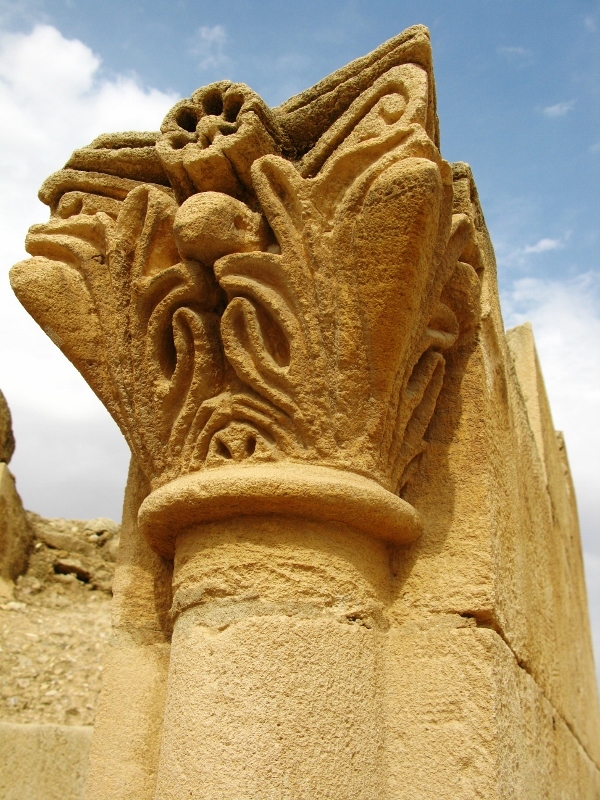 Today, the city is known as both The City of Palm and The Garden of God. Ruins discovered here date back 10 000 years, depending on whom you listen to. I’m a little annoyed at myself that I didn’t find the sycamore tree which the tax collector Zacchaeus climbed to get a better look at Jesus when he entered the city. But then, that’s always a reason to go back. 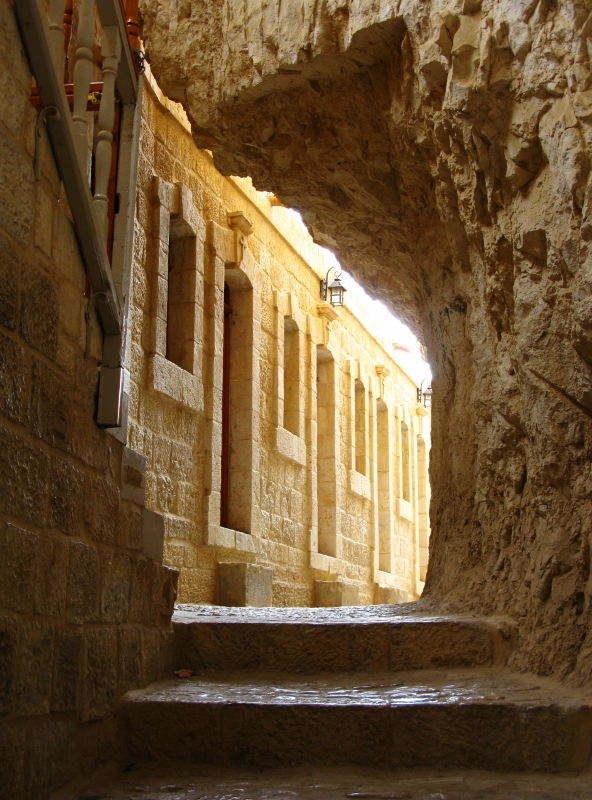 We visited the city to see the Monastery of the Temptation perched on the side of the Mount of Temptation. 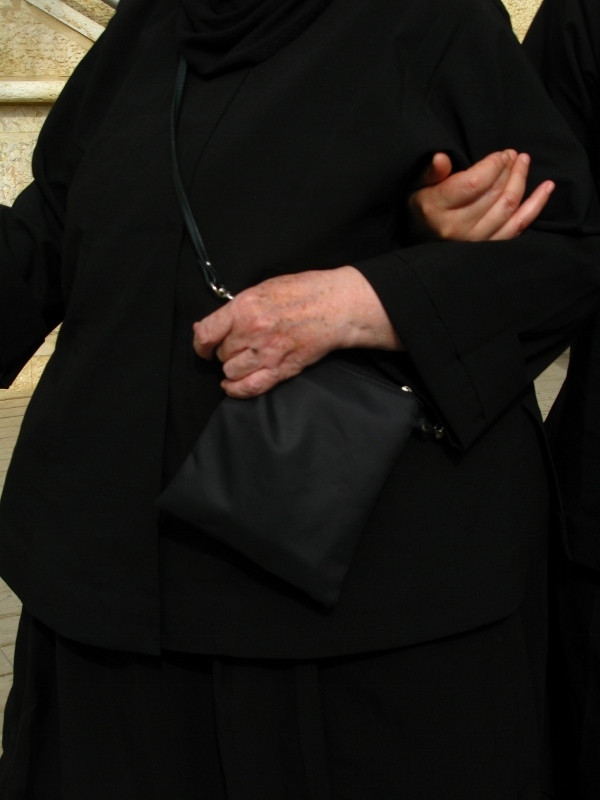 This particular Greek Orthodox Monastery allows women in … which was a relief. To conserve time rather than energy, we opted for the 5-minute cable car ride rather than the 30-minute hike up a steep path. 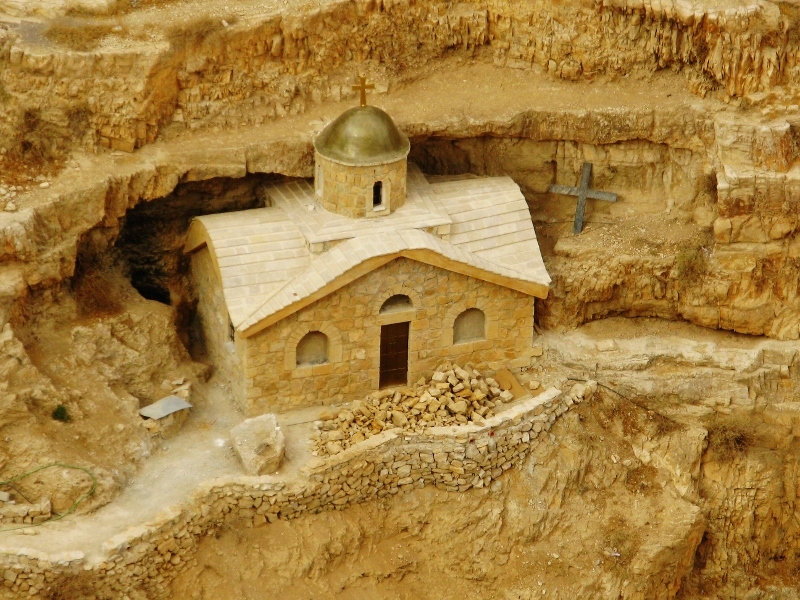 The monastery is built over the cave in which Jesus is supposed to have spent his 40 days and 40 nights being tempted by the devil. 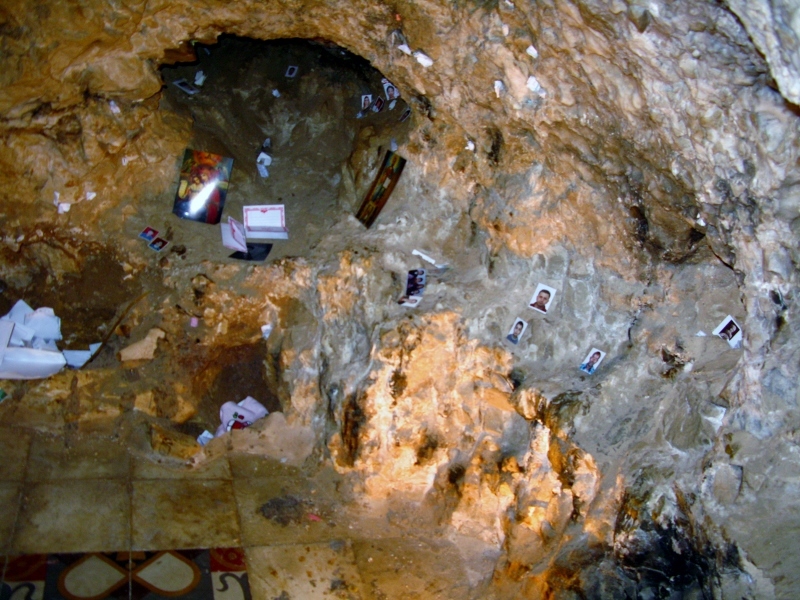 The cave is tiny – with barely room to stand up inside. 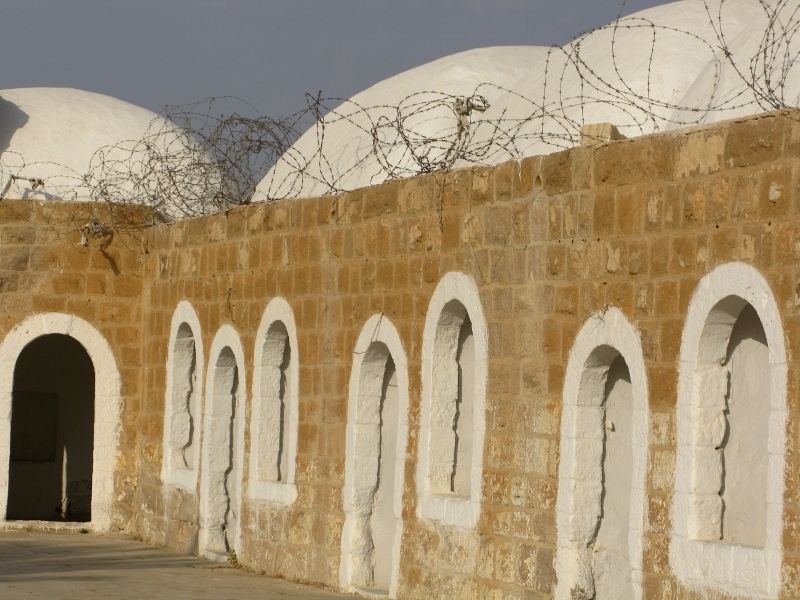 The hundreds of thousands of pilgrims who have trooped through it have left their mark. 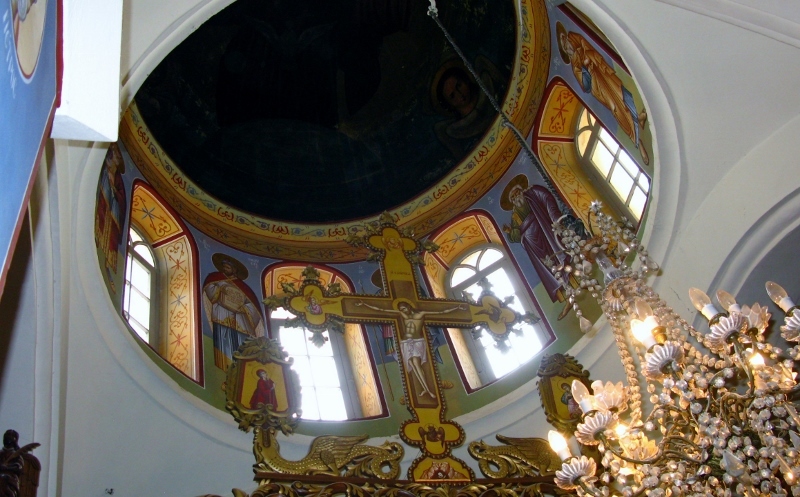 It was mentioned as far back as 326 when Helena of Constantinople identified it as one of the holy sites she visited on her pilgrimage that year and the present monastery was built at the end of the nineteenth century. I’m as guilty as anyone of taking photos and perhaps not spending more time in silent contemplation, but this monastery, like so many other places I visited, didn’t allow time for rumination. It’s like being on conveyor belt – with priests pulling you in one end and pushing you out the other. 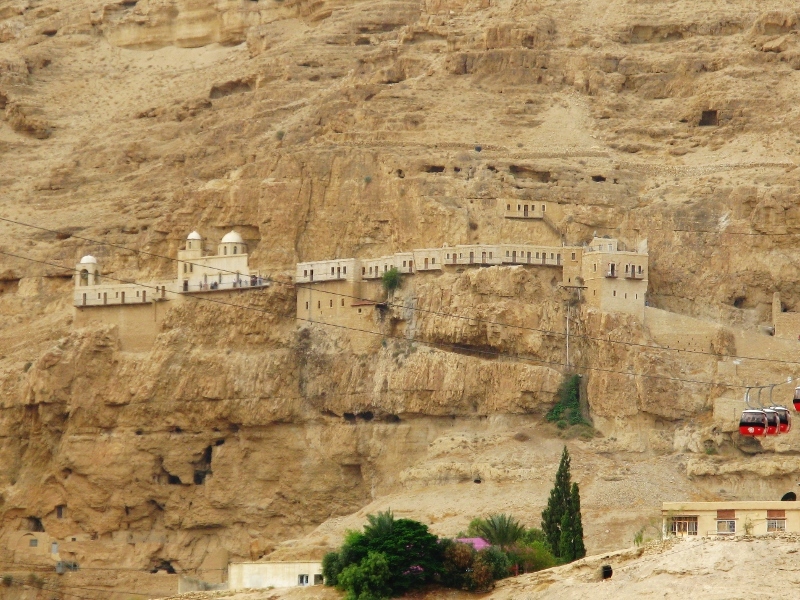 And yet perhaps because of its situation, perched as it is on the side of a mountain, this monastery felt just a little closer to heaven, to what I had expected of the Holy Land. For years, local builders had been helping themselves to the spoils of what has since been discovered to be an eighth-century desert castle. 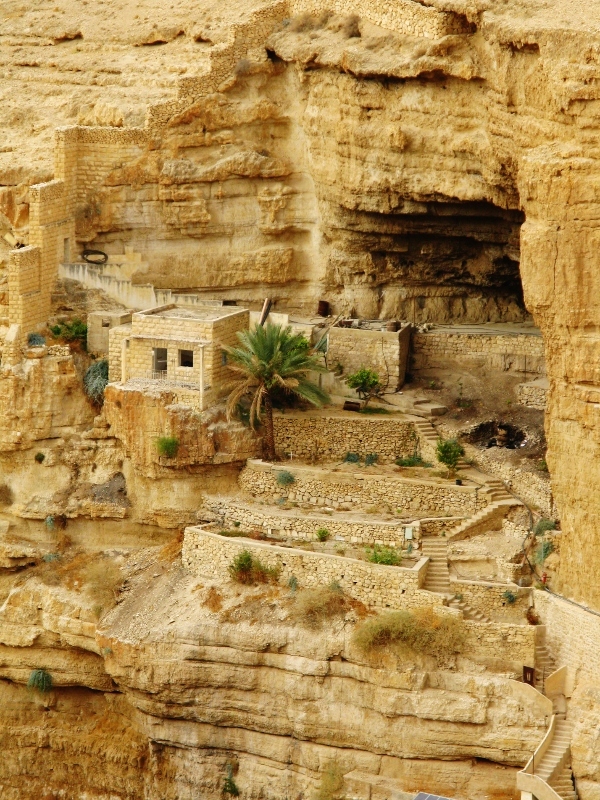 Hisham’s palace lies about 5 km north of Jericho in Palestine’s West Bank. It amuses me to think that houses built in the area prior to the excavation in the 1930s could well feature pieces of the palace. I like old books, old furniture, old buildings and old people, but there’s something about archeology that doesn’t quite do it for me. Yes, of course I can appreciate that so much has survived the ages and I can appreciate the glimpse such finds offer us to the past. But I rarely get excited about unearthed ruins. 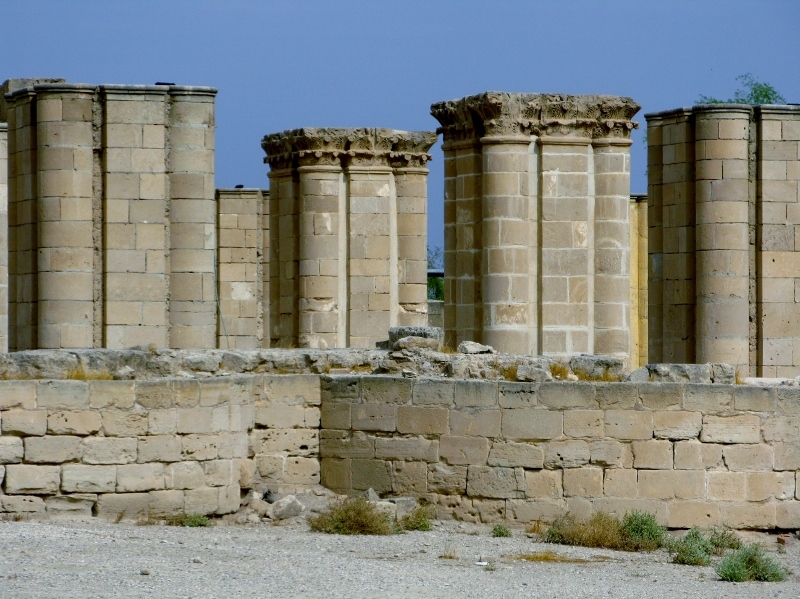 Hisham’s palace, while beautiful in a weird sort of way, has been firmly categorised as archeological in my mind. I wandered the grounds (which are eerily 260 metres below sea level) and saw the ancient carvings. I admired how the Rosetta stone had been put back together. And I gave due credit to the inventive signage on display. I recognised the importance of the place in terms of history and have since read that the Global Heritage Fund, in its 2010 report Saving Our Vanishing Heritage, has included it as one of twelve worldwide heritage sites most ‘on the verge’ of irreparable loss and destruction. And were that to happen, it would be a shame. For me, though, its magic lies in its mosaics. 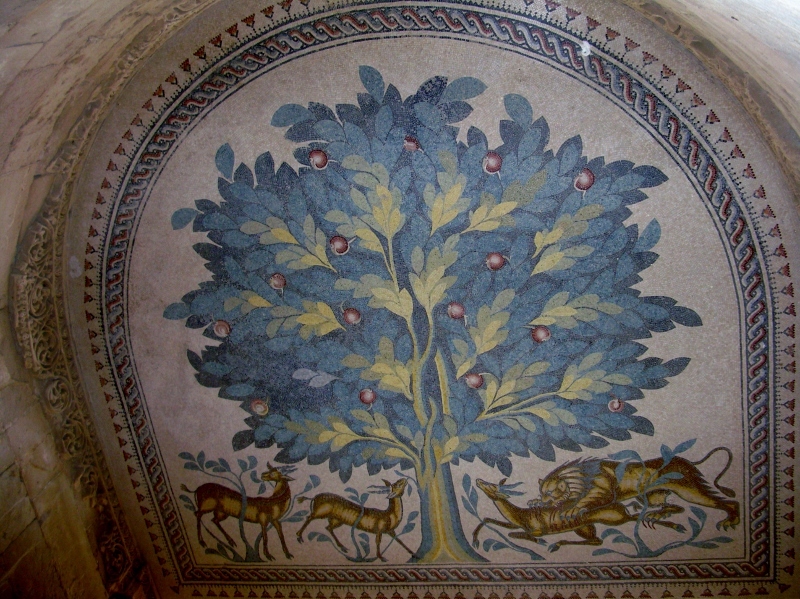 It is here that the world famous tree of life was discovered, a mosaic depicting the mythical tree with two deer grazing peacefully on one side of it, while a third deer is attacked by a lion on the other side. Those images certainly gave me something to think about. There are plans afoot to construct a 18-metre tall structure that will include walkways over the palace to shield the mosaics while at the same time allowing visitors to fully appreciate them. Work was supposed to start this year but I didn’t notice anything much going on. Award-winning Swiss architect Peter Zumthor is the man heading up what he calls an ’emotional reconstruction’. Once the rest of the mosaic floors are exposed, it’ll be on my list of places to revisit. It took a while for me to put my finger on what I was missing most – and then it finally dawned on me. Colour. The Judean Desert is practically devoid of colour. 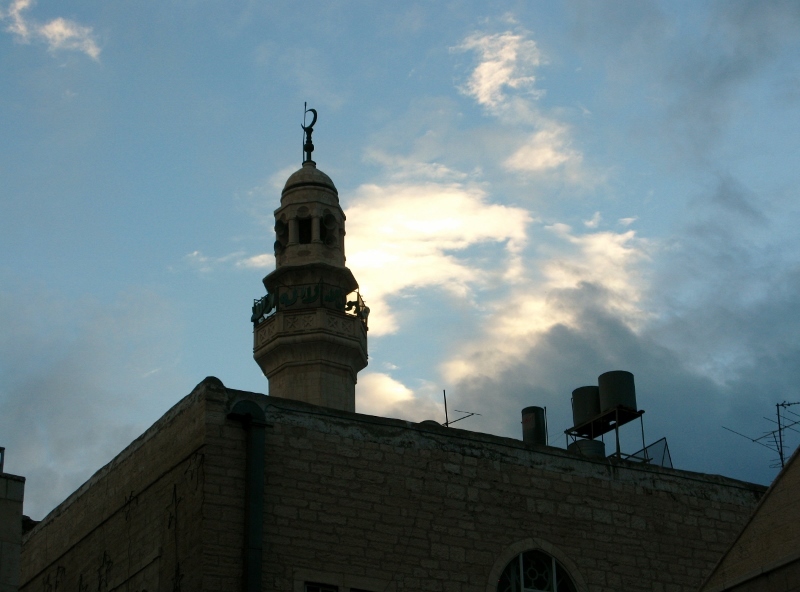 Jerusalem is built from the same brick – every building made from the same type of stone. 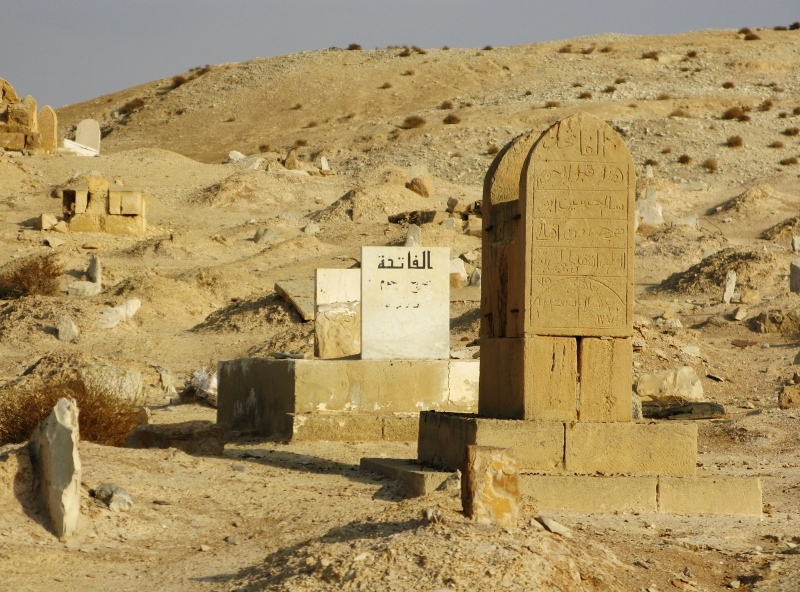 Even old monasteries like St George of Koziba, which is located somewhere off the side of the road on the way from Jerusalem to Jericho, are of the same cast (and yes, the road you see also features in the tale of the good Samaritan). Built as it into the side of a mountain, it reminded me, somewhat bizarrely, of Popeye’s village in Malta. I think perhaps the heat was getting to me. 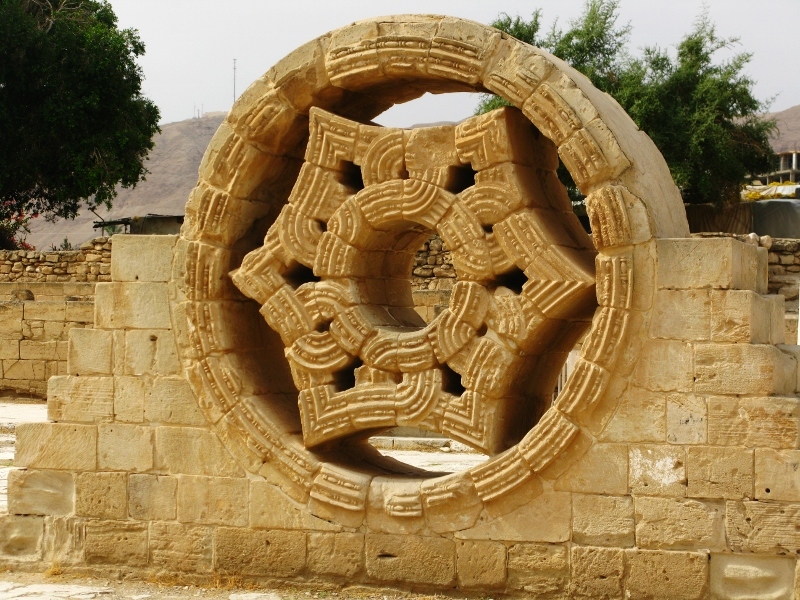 Anyway, back in 614, the Persians passed through, killing the 14 monks who lived there. The Crusaders had a brief relationship with the place in the 1100s but it wasn’t until 1901 that a Greek monk finished the restoration. 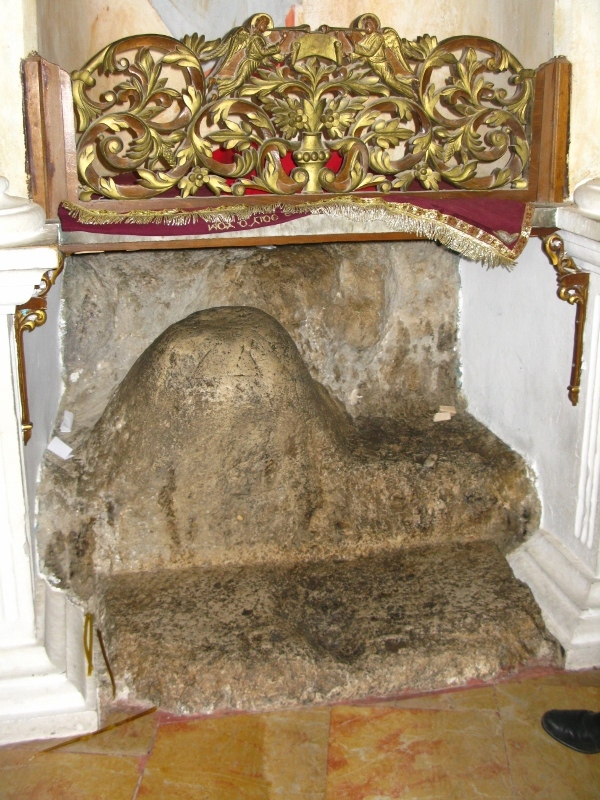 And it was here, apparently that St Joachim wept when an angel told him that Mary had conceived. The place is spectacular. Simply amazing. 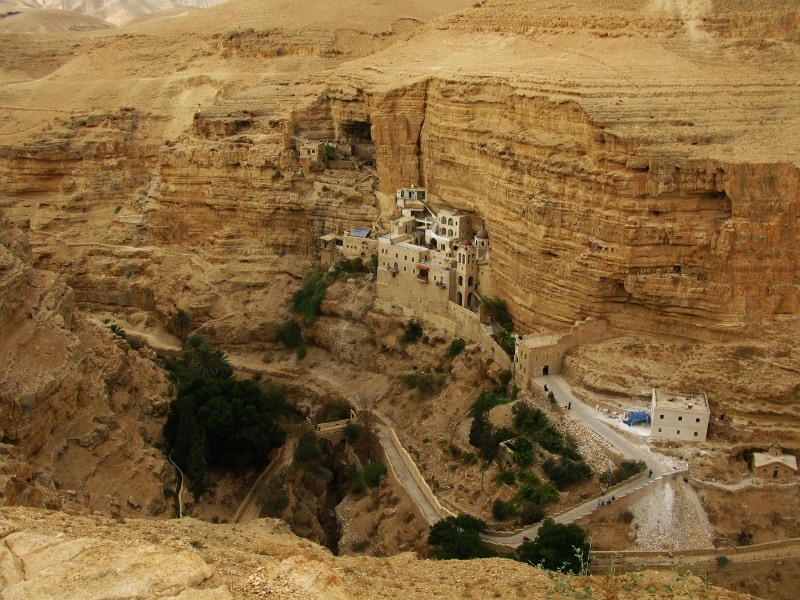 It wouldn’t take much of a stretch of the imagination to envision Elijah in a cave nearby being fed by the ravens – which apparently is what drew the monks here in the first place. Accessible by foot, it’s open to visitors, who amongst many other things, can have a peak at the remains of the 14 massacred monks. We contented ourselves with a view across the gorge of the Wadi Qelt, lost in the majesty of it all. I think it’s one of those places better appreciated from afar (and I, for one, was glad we didn’t make 2 hour trek to the front door). So where did it happen? Here are four words… immersion, submersion, aspersion, and affusion. When you read them, what one word comes to mind …. apart from ‘clueless’? 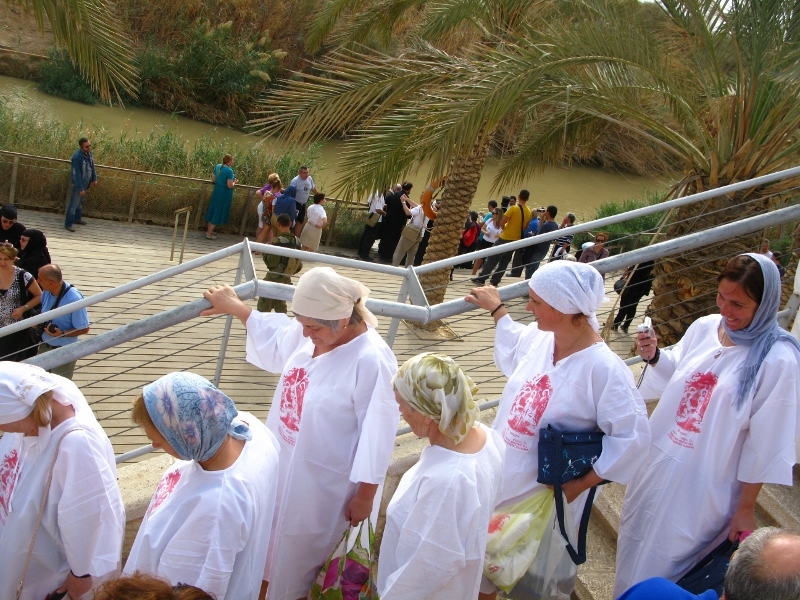 I had to think about this one for a while and although I did make an educated guess, given that I was standing on the banks of the River Jordan at the time, I couldn’t for the life of me explain the latter two. And I’m supposed to know this stuff. They’re all methods of baptism. Immersion and submersion are self-explanatory. Aspersion is baptism by sprinkling. Affusion is baptism by pouring. Ya learn something new every day. 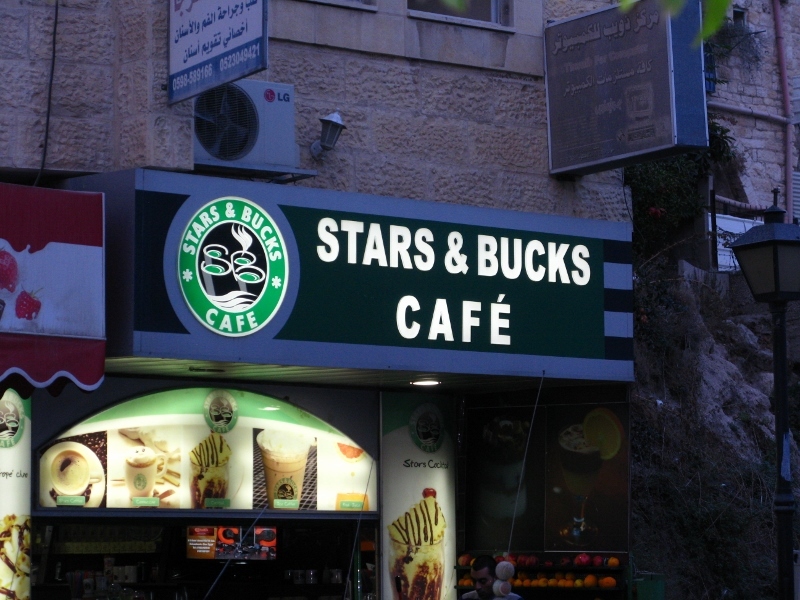 And in Israel I learned something new every hour. 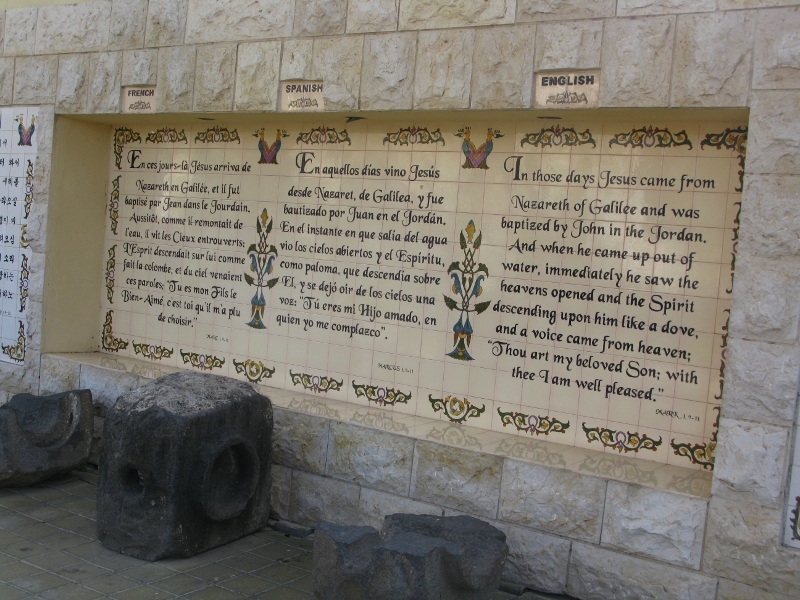 The bible has it that Jesus was baptised in the River Jordan. But… and in a region that is loaded with buts this might come a no surprise… the exact spot depends on your religion. 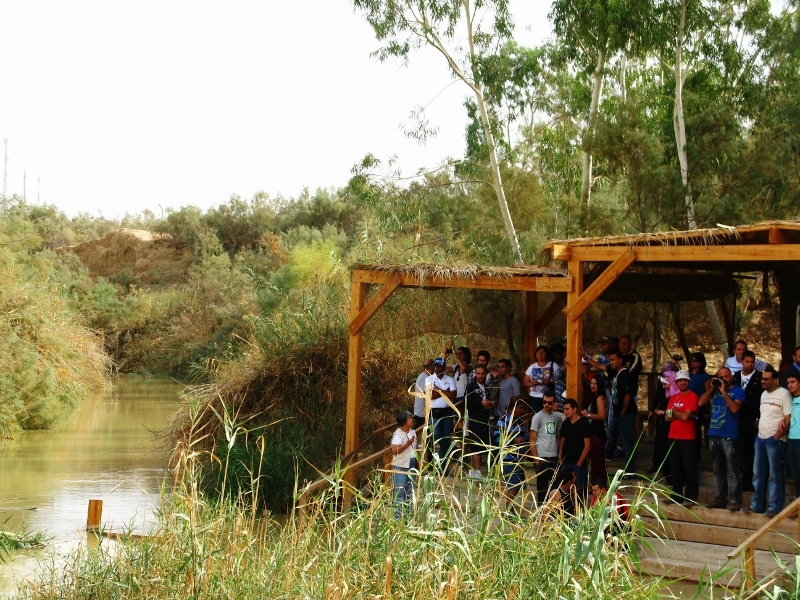 The Catholics and the Orthodox church have one spot near Jericho (relatively undeveloped) set across from a lovely church on the Jordan side of the river (it was rather amusing to see us taking photos of them and vice versa). 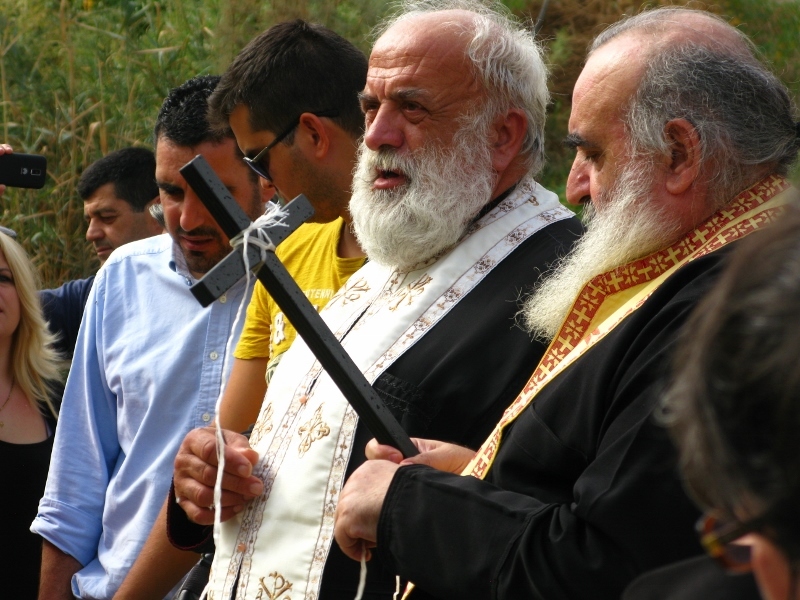 There was an Orthodox baptism going on with a strange ritual whereby the priest tied a piece of string to the cross and then threw it into the water, said some prayers and then pulled it out again. He did this three times. his flock. In the middle stood a couple of Israeli soldiers, young enough to still have their confirmation money. That’s one of the strangest things I’ve seen … kids, with guns nearly as tall as they are. Everywhere. Mandatory service is still part and parcel of life in Israel – three years for men, two for women. Interestingly though, the lambs are no longer going quietly to the slaughter. Profile 21 is a code used by the military to classify people not fit for service (physically or mentally) and rumour has it that there are increasing numbers of conscripts faking mental illness to get out of service. They have my sympathy. Honestly, some of them looked like they hadn’t begun to shave. 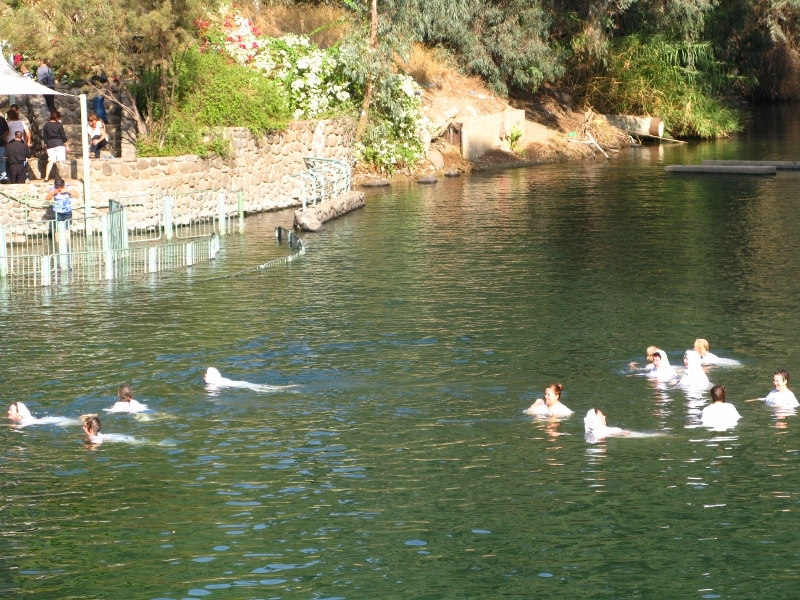 And, overlooked by these armed teenagers, pilgrims of all sorts made their way to the water, clad in the regulation white robes. The songs, sung in different languages, were haunting and the sanctity was palpable. Upstream, the Protestants have a much plusher spot, landscaped, and reeking of money. And this, too, is said to be the place it all happened some 2000 and more years ago. I stopped agonising over the truth about lunchtime on the second day and decided that my sanity depended on being able to literally go with the flow and to stop analyzing. Here, even the water is clearer. The banks of the river are lined with what’s called the Wall of New Life. 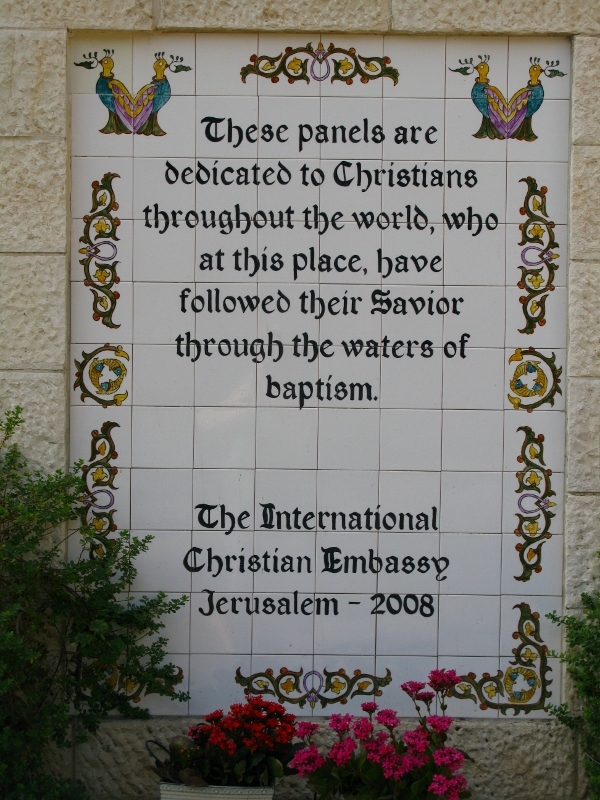 Various countries around the world have erected plaques with the bible passage translated in their language. Everything from Hungarian to Hawaiian pidgin. I searched for one in Irish but couldn’t find it. So, does it really matter which site is the real thing? Perhaps neither of them is. And in the grand scheme of things, it probably doesn’t make a dram of difference. I can’t help wondering though why the Christians can’t sit around a table and decide, once and for all, what’s what. Or just fess up and say that nothing’s for certain other than that it was somewhere in the River Jordan. Can it really be that difficult? https://unpackingmybottomdrawer.com/wp-content/uploads/2017/06/logo-300x82.png 0 0 Mary Murphy https://unpackingmybottomdrawer.com/wp-content/uploads/2017/06/logo-300x82.png Mary Murphy2013-11-15 23:35:032016-08-10 11:40:47So where did it happen? 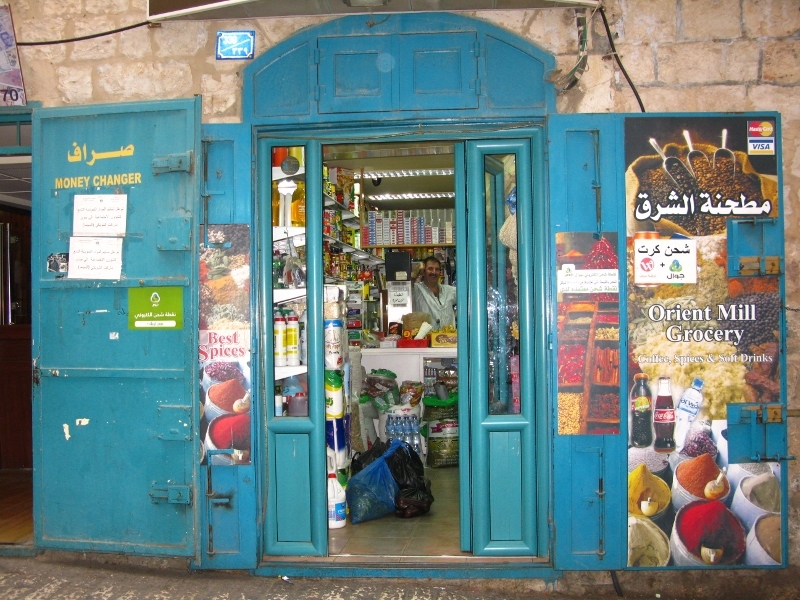 I have long since imagined Bethlehem as a little mountain village with perhaps one main street, an inn, and a manger. I had a romantic notion that it would be devoid of traffic, its sanctity disturbed by nothing more than the sound of birds singing and the soft gurgling of running streams. Was I ever wrong. Think Blackpool and add some religion. Hotels flaunting unimaginative names like the Manger Hotel Square or the Holy Family Hotel compete with stylized versions of American stalwarts. Souvenir shops offer all three grades of Olive wood – A (dried for at least a year), B (just dried – time not stated), C (not dried at all). 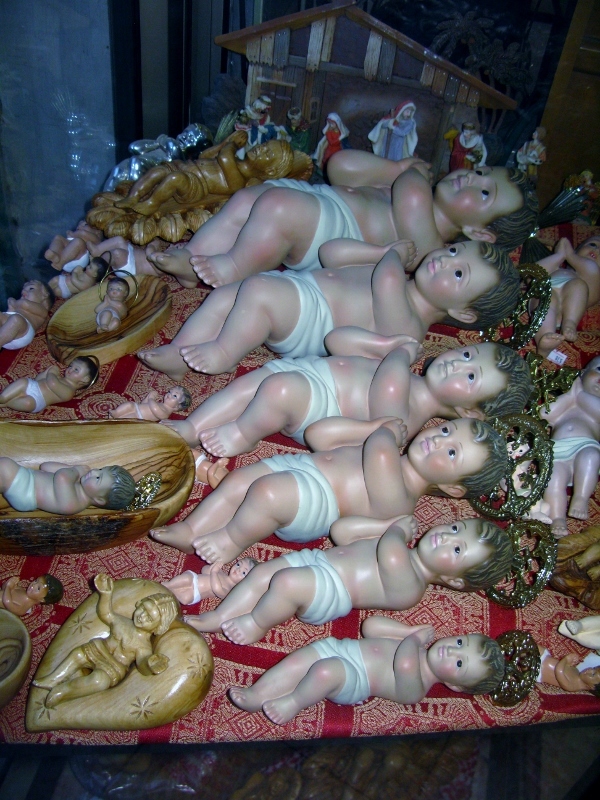 Nativity sets are ten a penny, and as for the Baby Jesus… well, rabbits come to mind. 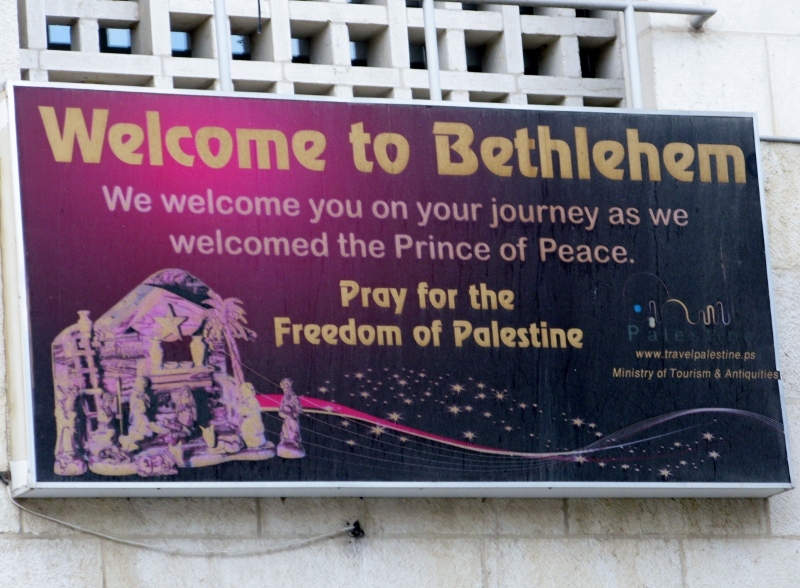 But what Bethlehem lacks in sophistication, it more than makes up for in friendliness. Everyone is in a good mood. Even the pairs of eyes peering out from the myriad black burkas seem to be smiling. The chap in shop we visited gave us coffee (all 27 of us!) and a rundown on what to look out for when making our purchases. Stallholders had that ubiquitous enthusiasm about their wares yet there was never pressure to buy. A car pulled up. The driver got out. He asked where we were all from. He then went on a good-natured rant for five minutes in which he showed how well versed he was in European politics, the religious beliefs of various American presidents, and the state of the universe in general. It seems that no one wants for an opinion. And he didn’t seem too bothered that we didn’t buy anything from the boot of his car. It’s people-watching heaven. 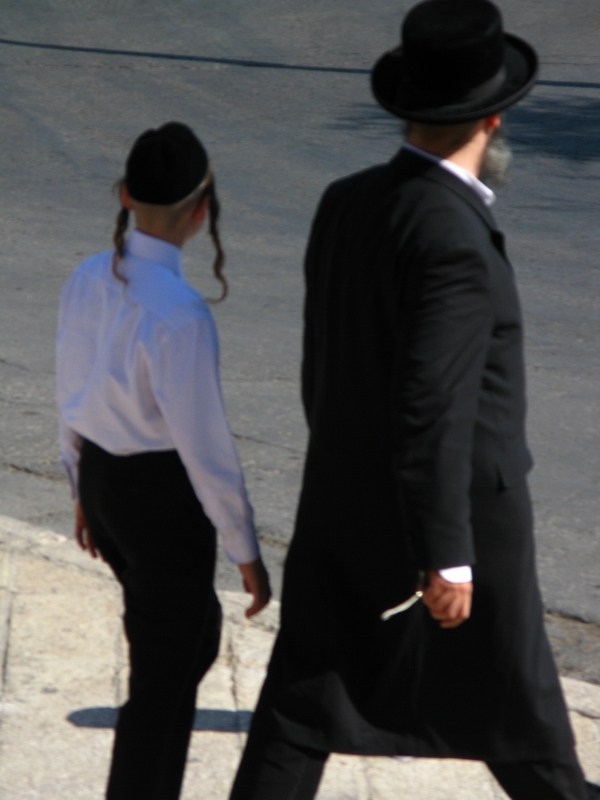 With so many tour groups from all over the world mingling with locals from all sorts of cultures and creeds, it’s in stark contrast with the monochrome palette I’d witnessed on the drive in to Jerusalem from the airport. And while the hustle and bustle would be welcome in other cities, it seems strangely out of place here. Perhaps my mother was right when she first introduced me to the ninth beatitude – blessed is she who expects nothing for she shall never be disappointed. As I write I’m trying to decide whether I’m glad I’ve seen it for what it is or whether, given the chance, I’d turn back the clock and keep the vision intact. But, given the week of revelations that I’ve had, I’m grateful that this is all that’s on my mind right now.